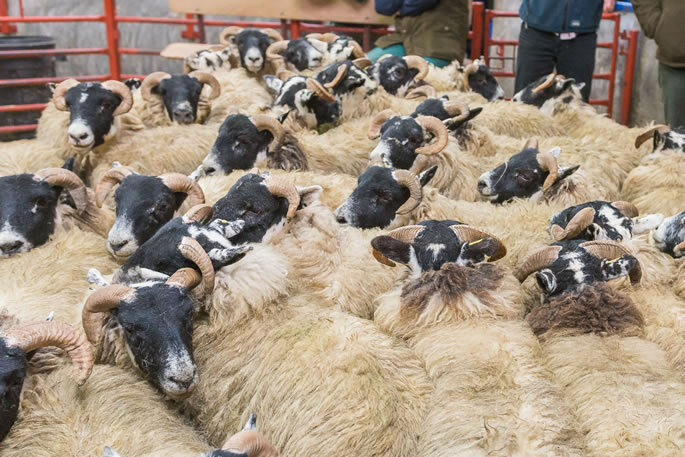 A huge show of 7,012 prime hoggs were forward for sale to the usual busy ring of buyers. 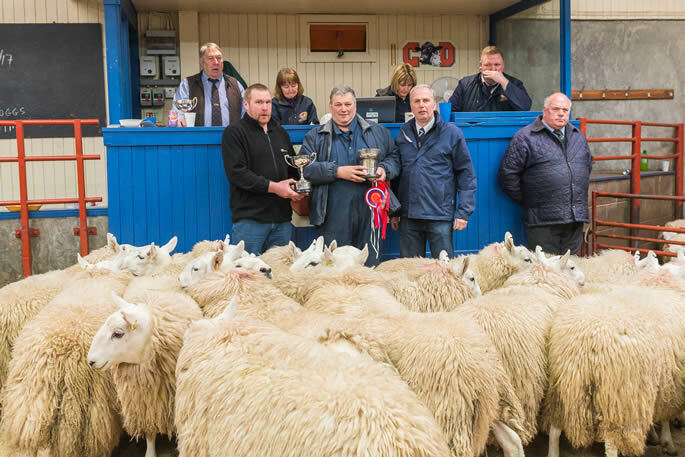 Also, today we held the Annual Show and Sale of prime Hill Cheviot hoggs on behalf of the South Country Sheep Society and kindly sponsored by the society along with PJ Tractors Parts, Longtown. 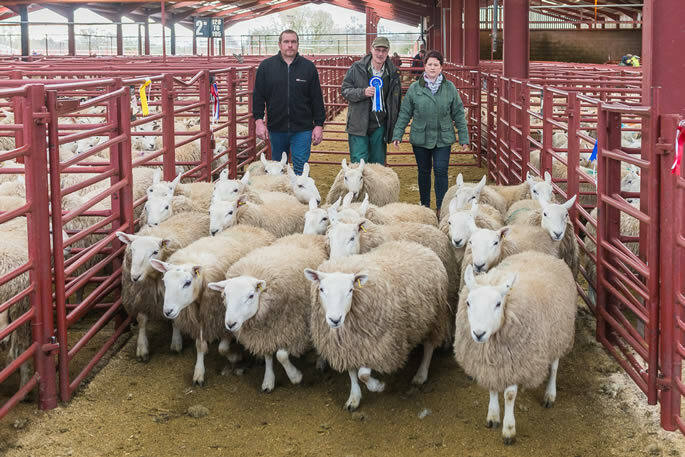 We also held the Annual Show and Sale of North Country Cheviot hoggs, again kindly sponsored by PJ Tractor Parts, with over 800 hoggs forward in pens of 20 (32 Hill Cheviots and 9 North Cheviots), judge Michael Lomax had his work cut out but ably found his Champions in each category. 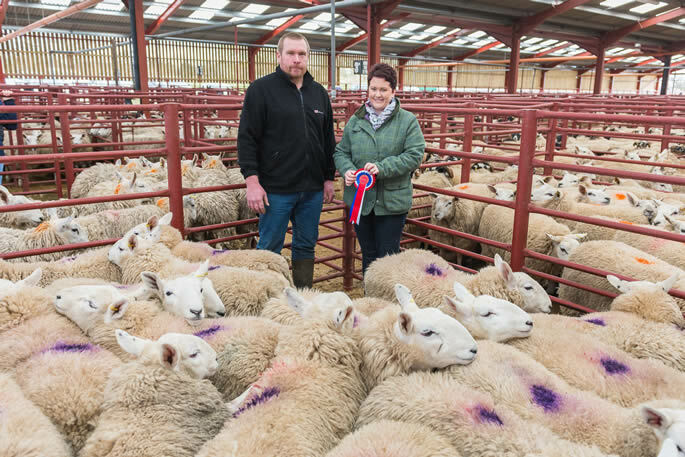 Firstly, awarding the Hill Cheviot Championship to Messrs Carruthers, Woodhall, Annan with a pen scaling 52kg and realising £90 to the judge. Reserve went to Messrs Hume, Sundhope, Yarrow weighing 39kg and realising £76 to Andrew Dawson. 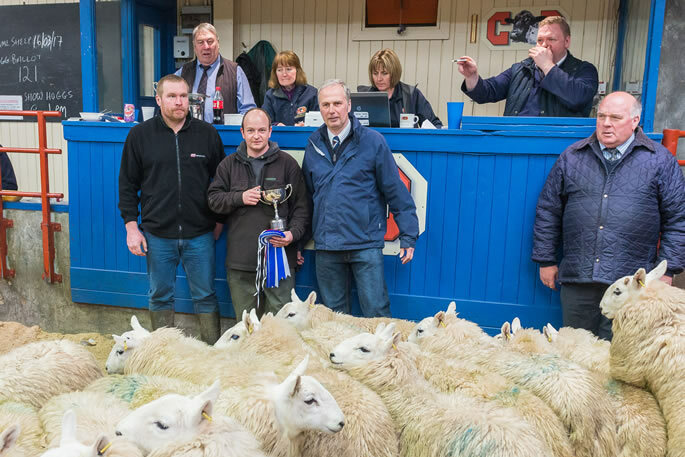 In the North section the Championship was awarded to far travelled supporters of the mart Messrs Conon Brae Farms, Torgorm, Dingwall, which scaled at 42kg and realised £75 again to Andrew Dawson. Reserves went to local consignor Messrs Eastham, Longburgh Fauld with his pen scaling 47kg and realising £80 to Messrs MacTaggart. 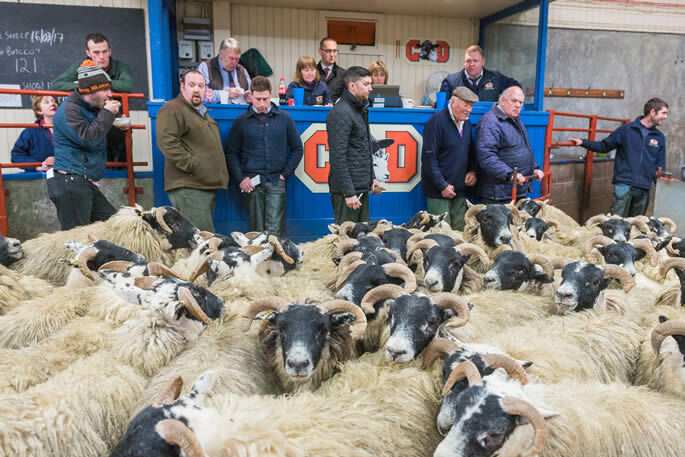 Out with the Cheviot show the weekly sale topped at 282p for an outstanding pen of Beltex hoggs from first time consignor Messrs Taylor, Easter Ochtermuthill, Perth who also had the top price per head of £115, again for Beltex hoggs. 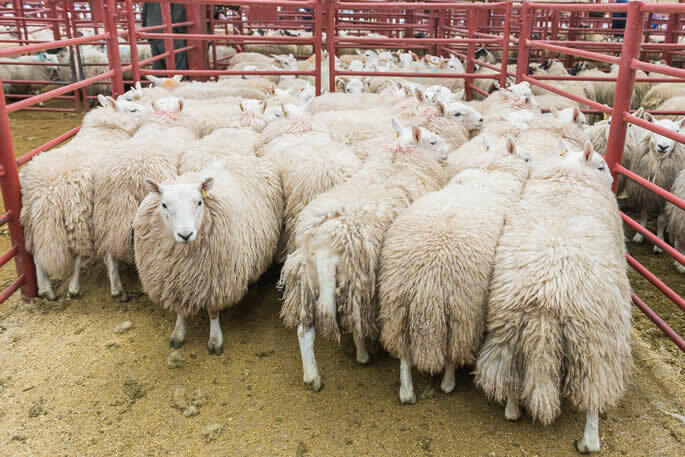 Many best quality hoggs regularly sold between 250-280p and remain short of an increased buyer requirement. Export hoggs got dearer all day and were lacking in numbers all through the country. 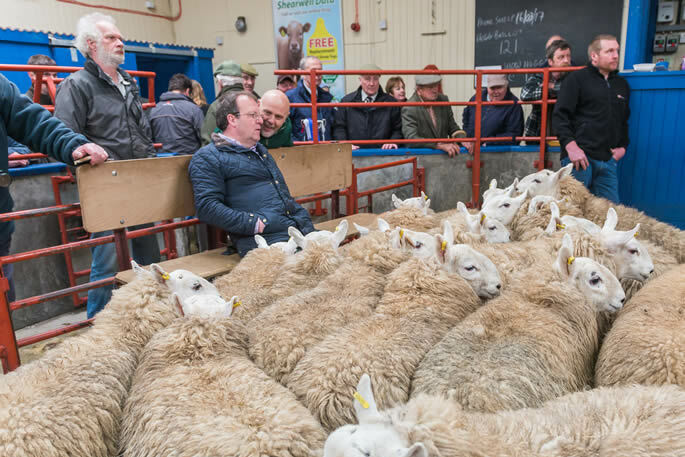 Heavy hoggs were slightly steadier owing to massive amounts across the country. 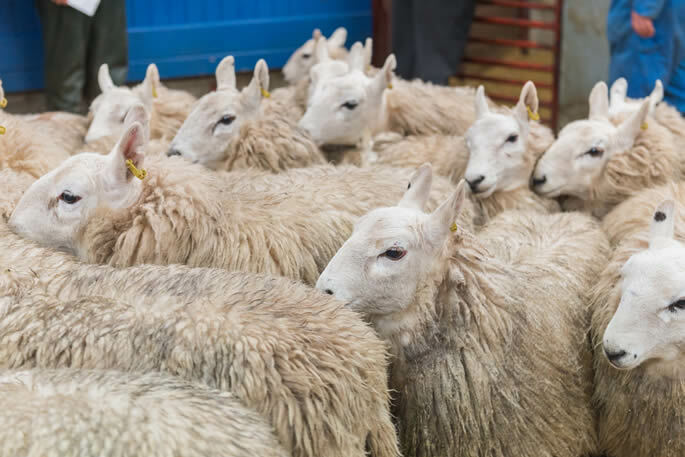 Lightweight hoggs remain at recent rates. 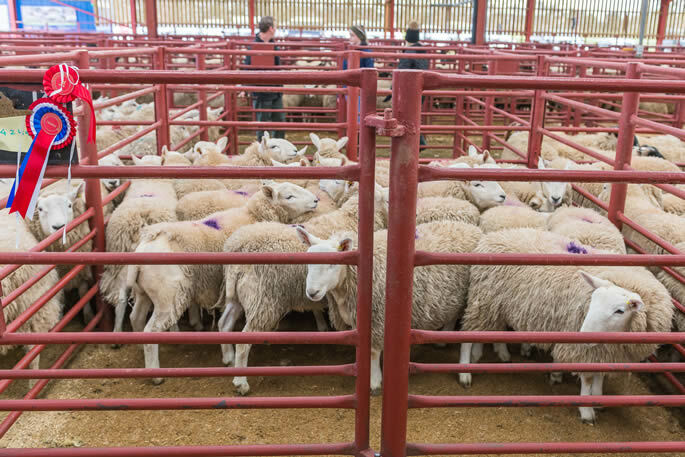 Sale averaged 168.8p (SQQ 177.3p). 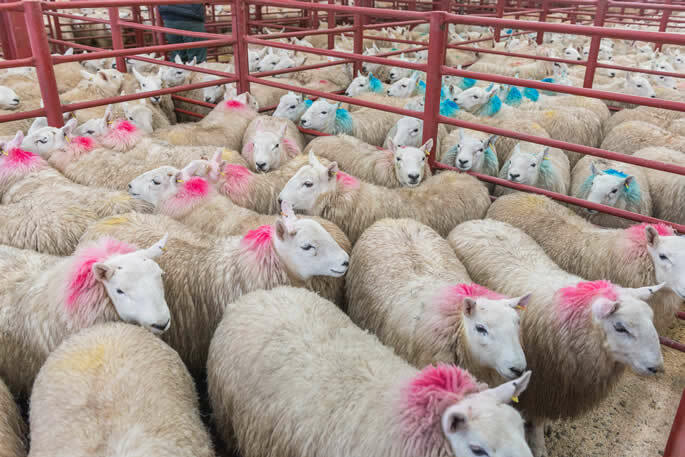 Beltex 282p Easter Ochtermuthill, 278p Oakwood, 274p Easter Ochtermuthill, 270p Oakwood, 269p Finnieness, 263p, 261p Greenaton, 256p Bridgestone, 255p Greenaton. Texel 240p Drumcairn & Thornthwaite Close, 235p Conon Brae, 233p Copperthorns, 232p Greenaton, 230p Copperthorns, 226p, 223p The Farm, 223p Forget-me-not, 221p Copperthorns. 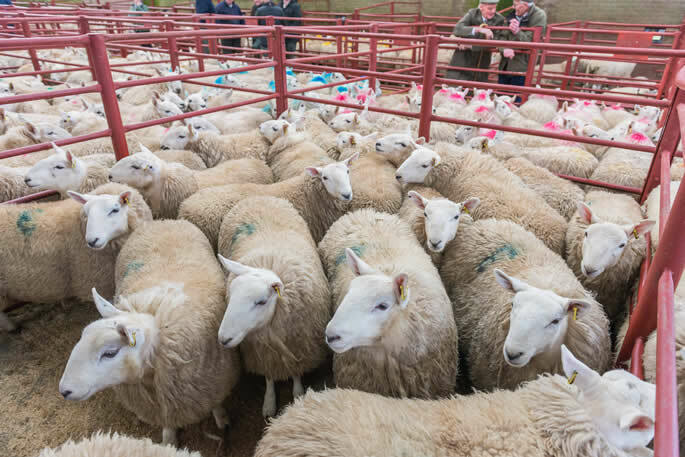 Charollais 208p Tinnishall, 184p Conon Brae, 181p Hallburn, 179p Sceugh Dyke, 177p Low Eals, 173p Yonderton. 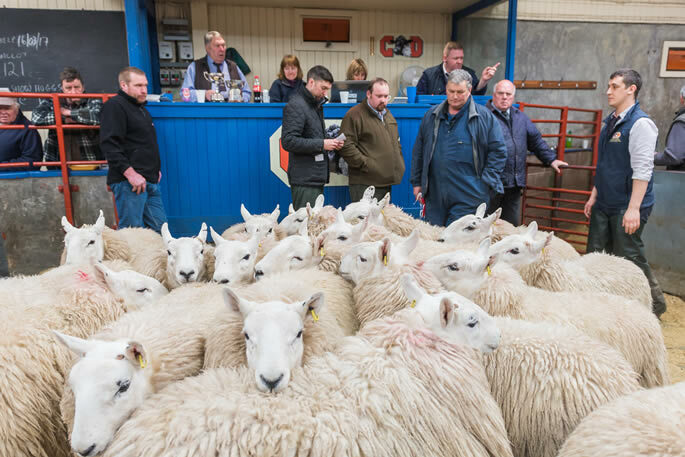 Cheviot 195p Sundhope, 188p Gilshaw View & Hermitage, 186p Glendearg, 183p Becks, 182p Sorbie, Sundhope & Gilshaw View, 179p Sundhope & Glendearg, 178p Chanlockfoot & Tushielaw, 177p Chanlockfoot, 176p Clonrae, 175p Hermitage. Suffolk 191p Whiteside, 190p Shield Green, 183p Thurdistoft, 179p Balmaglester & Whiteside, 177p, 176p Thurdistoft, 174p Glenehervie, 173p Tinnishall. Blackface 187p Corsebank, 186p Hallburn, 185p Linfairn, 185p, 183p West Scales, 183p Clonrae, 182p Larg Farming, 181p Sceugh Dyke, Linfairn, Hallburn, Matyholm & Chirdon. 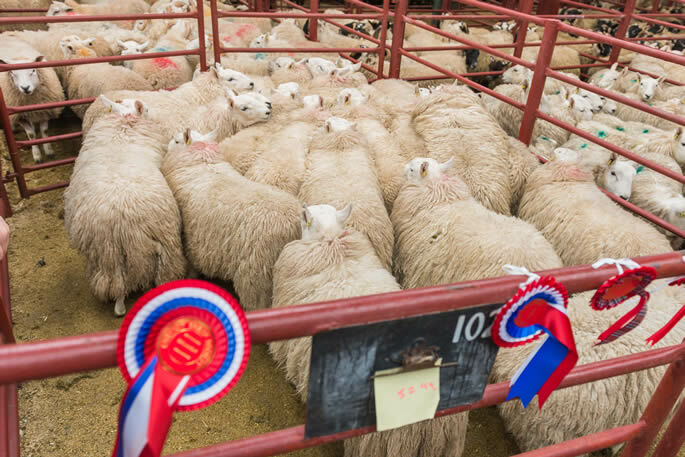 North Country Cheviot 185p Conon Brae & Marwhirn, 183p, 180p Whitefield, 180p Balmaglester, 179p Conon Brae, 177p Marwhirn & Westwood, 176p Lurgan, 175p Station Yard. Cross 174p, 173p Killipol, 171p South Lassan, 168p East Skeroblin, 167p High Cattadale, 166p Killipol, Wood Farm & Arivore, 165p Marwhirn. Cheviot Mule 170p Marwhirn, 169p West Scales, 164p Stobshiel Mains, 163p Marwhirn. Herdwick 153p, 152p Pasture House. Beltex £115 Easter Ochtermuthill, £113, £112, £111 Greenaton, £110 Easter Ochtermuthill, £108 Bridgestone, £107 Easter Ochtermuthill, £105 Finnieness, £103 Oakwood. 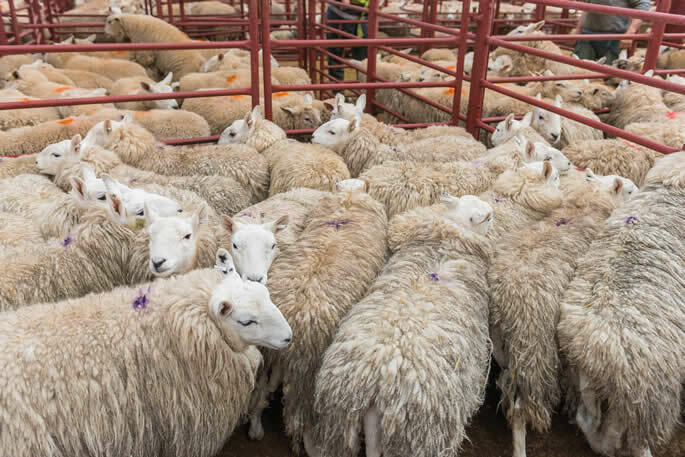 Texel £100 Copperthorns, £99 Nether Stenries, £98 Greenaton, £97 Nether Stenries, £86 Thornthwaite Close, £95 Cleughbrae, £94.50 Copperthorns, £94 Conon Brae, Bryndansi & The Farm. 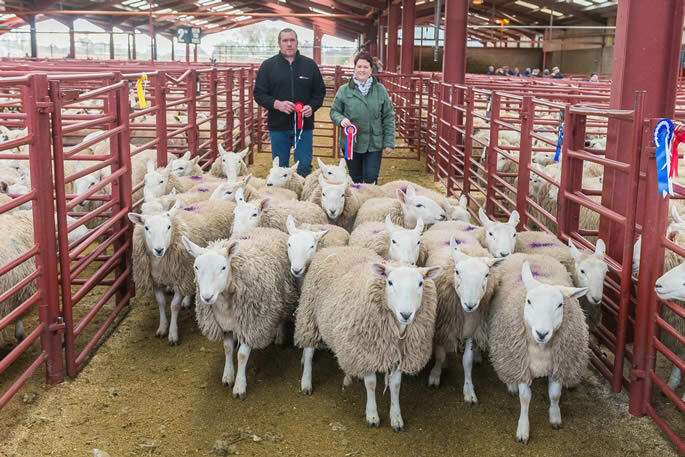 Cheviot £90 Woodhall, £85.50 Sherra Craig, £85, £81 Longburgh Fauld, £81 Sandbed, £80 Sherra Craig, £78.50 Tushielaw, £78 Becks & Woodhall. Suffolk £90 Birdsnest, £86.50 Land, £86 Balmaglester, £84.50, £83 Land, £83 Oswie, £82 Sceugh Dyke, £80 Oswie & Longrow Cottage. 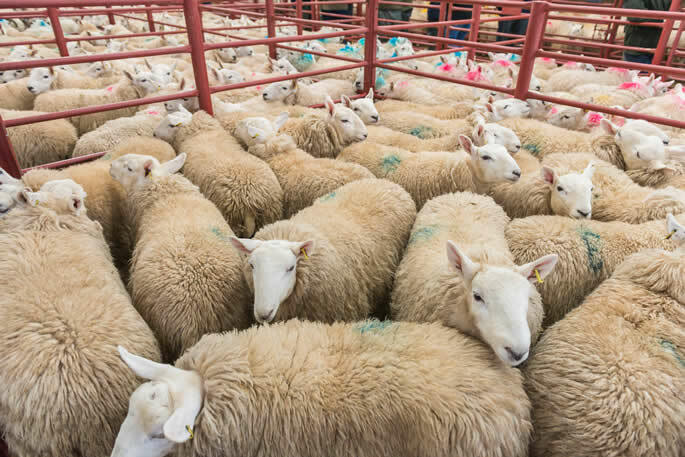 Charollais £83 Tinnishall, £78 Yonderton, £76 Hallburn & Cardewlees, £75 Sceugh Dyke & Waterside, £74 Cardewlees & Broomhills, £70 Conon Brae. 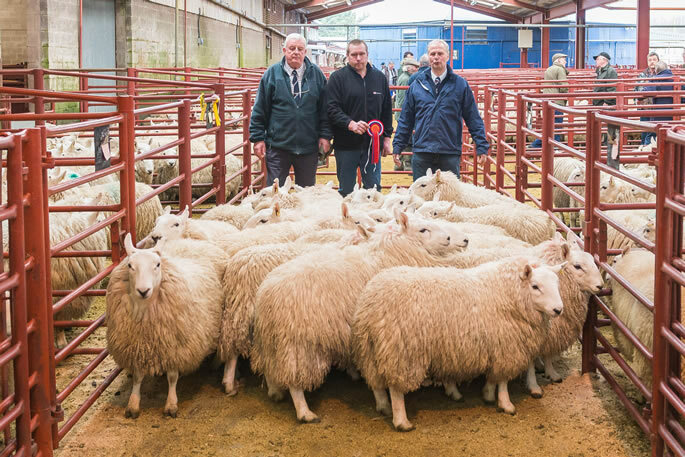 North Country Cheviot £81, £80 Longburgh Fauld, £80, £78 Station Yard & Cleughbrae, £77 Waterside & Station Yard. 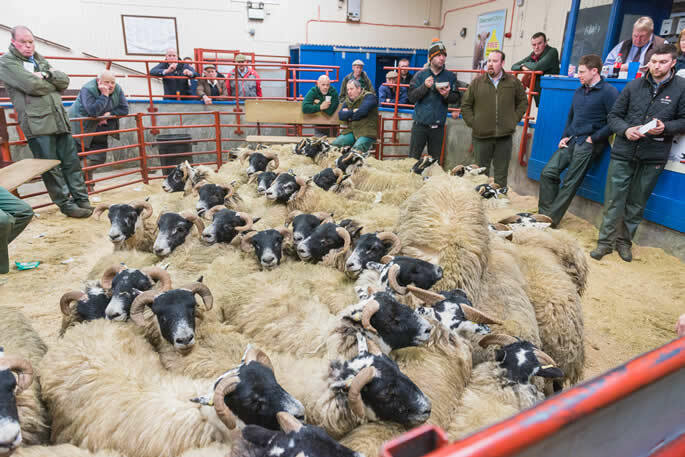 Blackface £80 Corsebank, £78, £77 Kirkland, £77 Larg Farming, £76.50 Yett & Sceugh Dyke, £76 Linfairn, Kirkland & Milnmark. 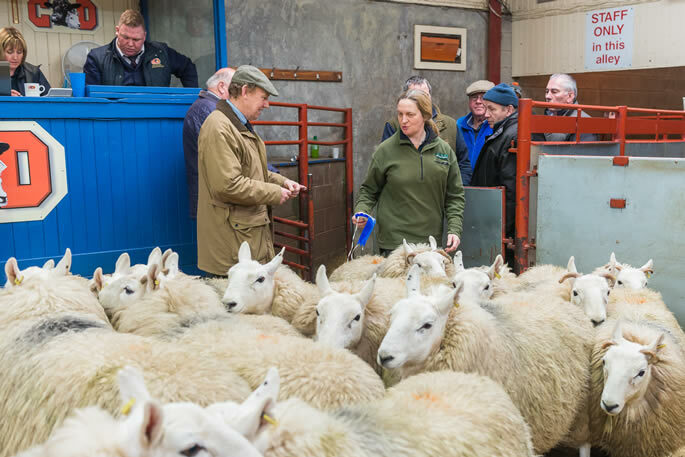 Cross £77 South Lassan, £76.50 Wood Farm, £76 Kirkhouse & Glenehervie, £75 Oswie, High Cattadale & Jerriestown, £74 Sweethope, £73 West Scales & Killipol. Cheviot Mule £76 West Scales, £75 Marwhirn, £74 West Scales, £72 Stobshiel Mains. 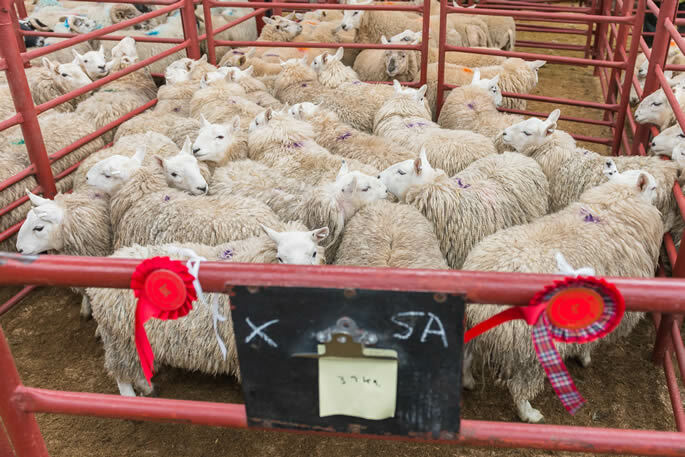 A similar show of 3,991 cast ewes and rams was presented to the usual ring of customers, but far more leaner ewes on offer. Trade shows rise on paper but in reality they would be similar on the week. 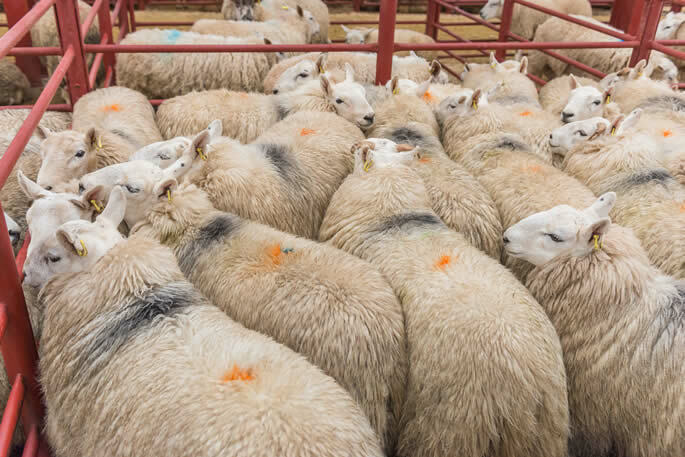 Heavy best quality ewes remain easily sold with flesh sought after in all categories. Rams also dearer today. 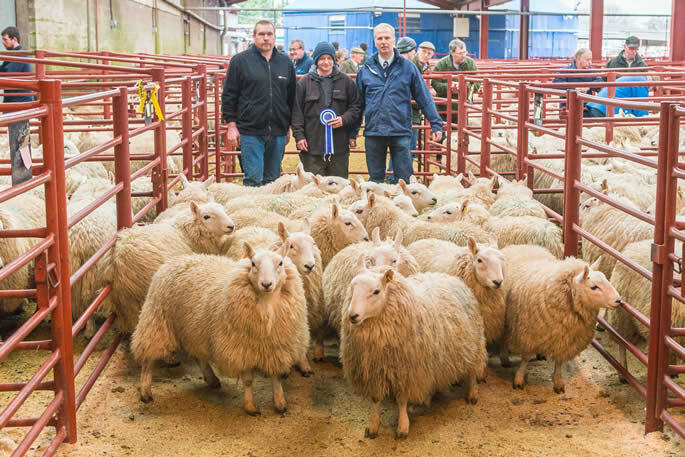 The sale topped at £150 for a great pen of Texel ewes from Messrs Campbell, Dinnans, Newton Stewart. 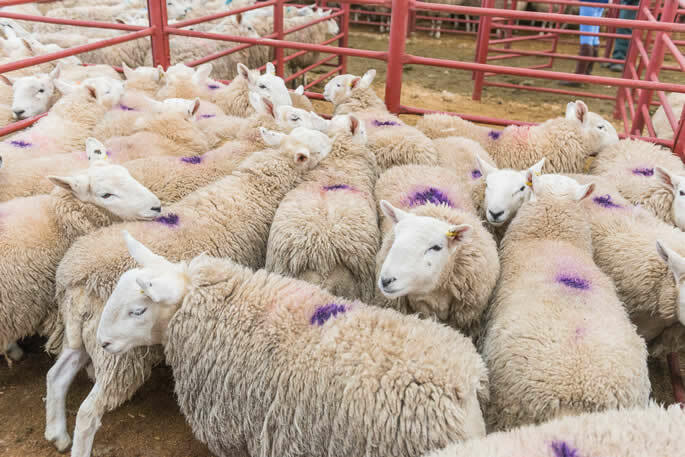 Rams to £118 for Texels from Marygate. 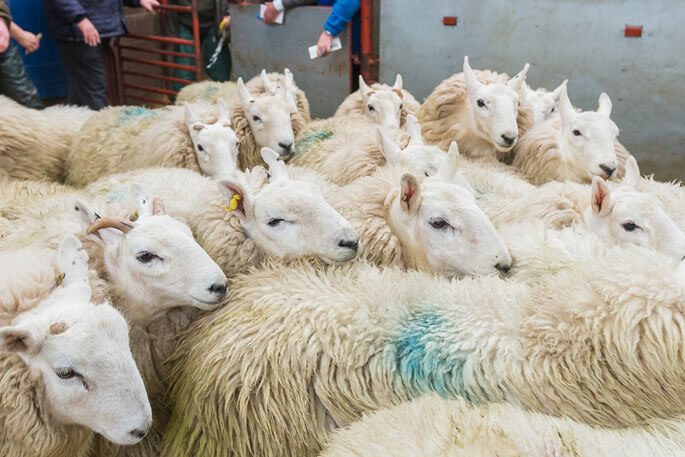 Texel £150 Dinnans, £146 Heatherglen & Marygate, £144 Chaseside, £142 Stobshiel Mains, £138 Kirkton & Sandilands, £134 Chaseside, £128 Hillside, Haithwaite & Heatherglen, £127 Kirkton, £126 Beck Farm, £124 Beckfoot, £123 Heatherglen & Greenaton, £122 Newbigging. 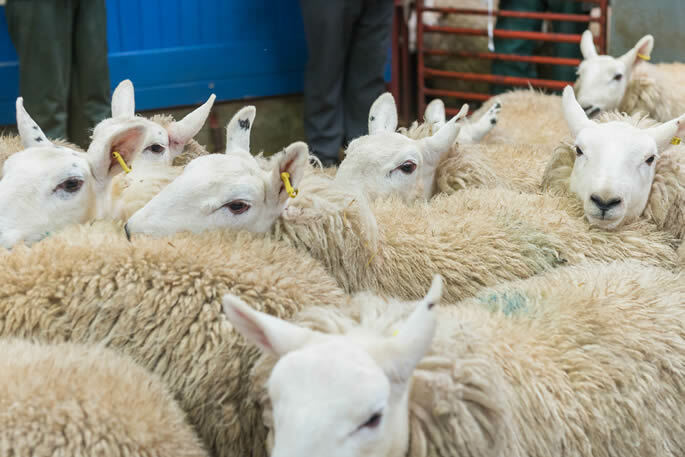 Charollais £128 Beckfoot, £106 Copperthorns & Chaseside, £100 Beckfoot, £98 Rye Holm, £94 Broomhills, £90 Beckfoot. Suffolk £128 Rye Holm, £116 Chaseside & Marygate, £115 Beckfoot, £110, £107 Heatherglen, £108 Rye Holm £107 Beckfoot & Swaites, £105, £102 Chaseside, £104 Oswie, £102 Chaseside, Yonderton & Marygate, £100 Beckfoot. 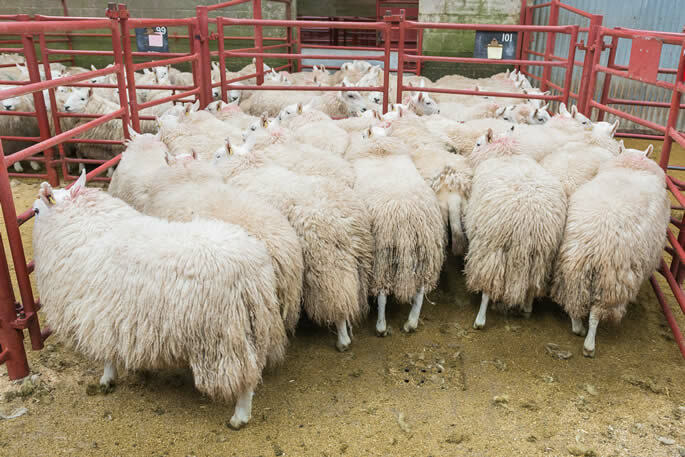 Beltex £112 Easter Ochtermuthill, £110 Wood Farm, £108 Newbigging, £106 Oakwood. North Country Cheviot £100 Stobshiel Mains, £92 Lythmore, £88 Stobshiel Mains, £86 Kimmeter Green, £83 Beckfoot, £82 School House. Blue Leicester £95 Gapshield, £92 Millknowe & Bryndansi. Cross £91 Dinnans, £89 Lythmore, £88 Oswie, £86 Comlongun Mains, £85 Lower Ardmannoch, £84 Green Aton, £82 Mains of Collin, £81 Newbigging & Greenaton. Cheviot Mule £90 Smyllum, £85 Viewley. Lleyn £78 Marygate, £57 Eastside. Goat £73 Viewley, £60 Chaseside & Heatherglen, £59, £58 Sandbed. Easycare £68 Hill House, £64 Bairnkine. Kendal Rough £67 Gill Head. 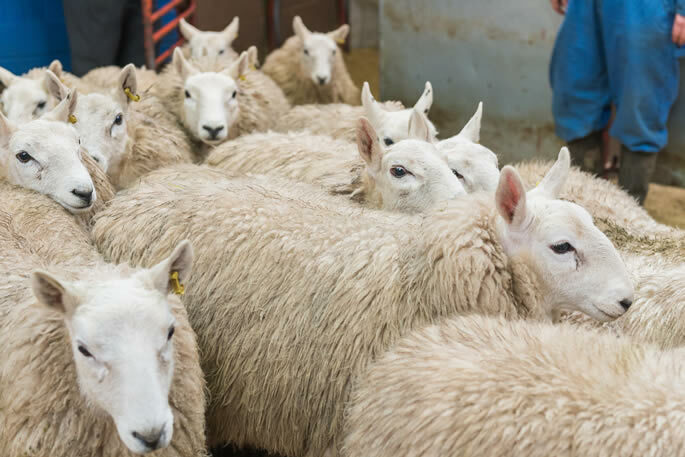 Blackface £67 Mains of Collin, £63 Chirdon, £62 Bowanhill, £60 North Middleton, Middlepart Crescent & Haithwaite, £59 Mains of Collin & Larg Farming, £56 Newbigging, £54 Laggan View. Cheviot £65 Hermitage, £63 Crossdykes & Yonderton, £60 Allfornaught, £58 Hopsrigg & Bryndansi, £57 Nether Stenries, Sorbietrees & Allfornaught. 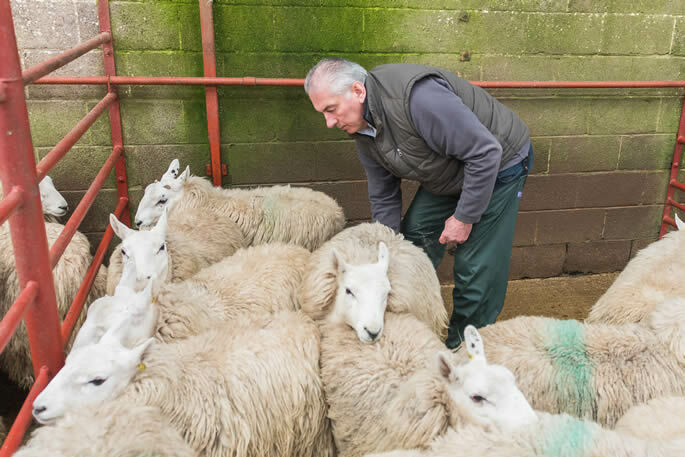 Texel £118 Marygate, £116 Dinnans, £114 Rack Beck, £112 Hallburn, £110 Tundergarth Mains, £106 Slicky, £102 Yonderton, £100 Eastside. 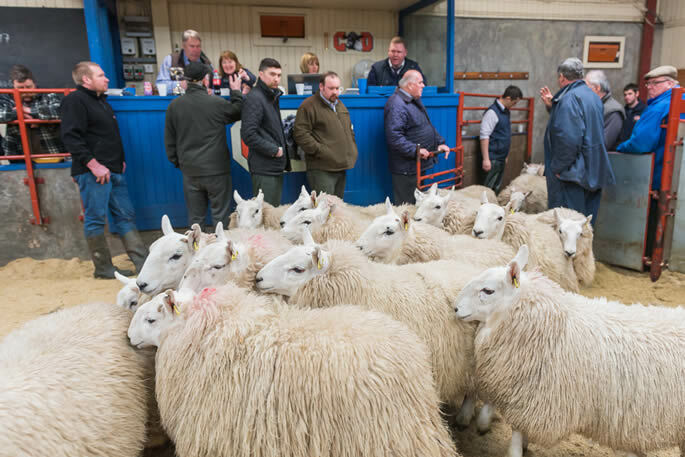 Charollais £116 Slickly, £106 Kirkhope, £100 Hallburn. Suffolk £109 Thuster Mains, £106 Yonderton, £100 Kirkhouse. 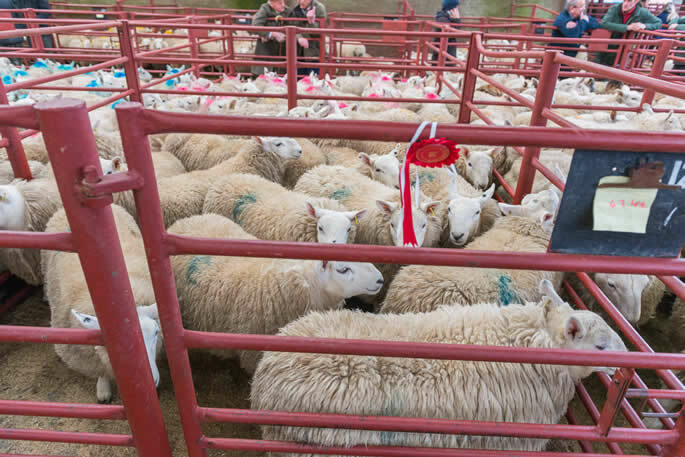 Blackface £73 Chirdon, £72 Riskenhope & Kirkhouse, £67 Bowanhill, £65 Kirkhope.